“Lezaine Davis lives in a small flat with his mom, aunt, gran and sister in the community of Macassar in Cape Town. Whilst his mom and gran are instrumental in providing a solid upbringing for him, he has no male role model in his life. His mom works full-time and between mom and gran, a good education and the importance of attending school has always been impressed on him. 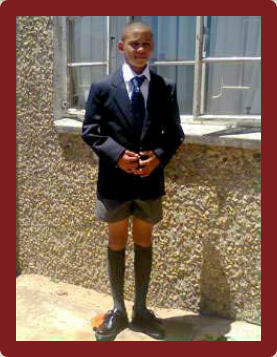 Despite this positive influence in his life, he was still playing truant at school.” “Lezaine began attending the Helderberg Academy in 2013 through friends who invited him to attend a training session. He was part of the rugby team at his local school and was showing great potential for the game. Lezaine would like to be a professional rugby player when he grows up. He is a typical quiet, introverted teenager who eats sleeps and breathes rugby, however, mention the rugby and he is transformed - talking animatedly about the game. As is typical of many young people in these communities, he would come across as an overly-confident even cocky player, which belies the low self esteem beneath. The Academy saw the potential in Lezaine and would challenge and push him to by playing him above is age group. Lezaine rose to the challenge and his character thrived, especially in competition scenarios. Over time his character softened as the Academy shaped the person within the player. The Academy leant him his first pair of rugby boots which gave him the opportunity to play for the school team.” "The Helderberg Academy help me a huge amount in the skills they taught me and the confidence it gave me, so that I could take the opportunity I have," says Lezaine. He is now training to get into the WP junior squad which is the equivalent to a regional team. “His perseverance and commitment paid off as this year he was offered a scholarship for a secondary school specialising in sport so that he can pursue his dream. His mom wrote to the Academy and described the positive influence the they had on his life during the short time. Truancy, gangsterism and drugs are a harsh reality in the lives of these young people especially when there is a lack of positive affirmation and opportunities for positive development. The Helderberg Academy continues to provide that positive influence and consistency in the lives of the young people there.” A message from his mom, "I just want to take this opportunity to thank you for the time that Lezaine attended the activities with the Helderberg Academy. You played a big role in his life to achieve this opportunity. I know that he will help the Academy as soon as he finishes his high school career. " 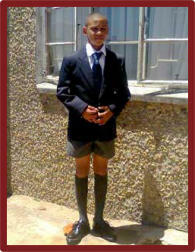 Thanks to the Helderberg Academy, Lezaine has a positive future ahead. 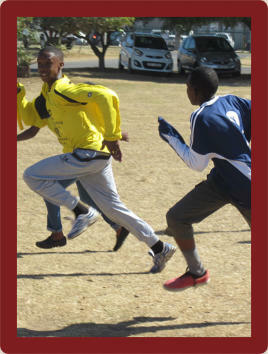 Through home visits, sports holiday clubs and weekly sports sessions, the Helderberg Academy continues their vital work. Find out how you can support them. If you would like to make a difference in the lives of the people we support, contact us. No matter how small the amount, every donation makes a positive impact. Handmade Jewellery Ukuthasa supports small business projects with start-up funding to help men and women develop skills which can be used to create a source of income. Story from a Mentor Peer Educator Ukuthasa Peer Education Programme provided a Life-skills programme aimed to enable young people to make wise choices about education, future goals and careers, community involvement and upliftment as well as life decisions around sexuality and sexual choices. Athenkosi Emyezweni School provides vital foundation stage Education to young people in disadvantaged communities.